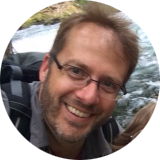 waterfalls – Tour Guide Mark – Let's Go Exploring! If you thought such a world only existed within the mind of a child, look no further than the Trail of Ten Falls at Oregon’s Silver Falls State Park. 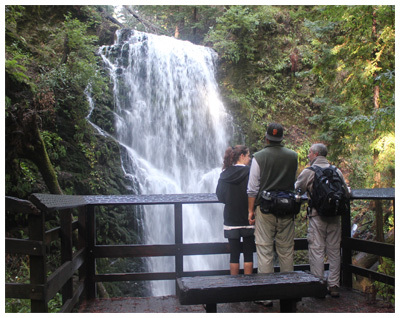 Within a five-hour hike, your inner child can see ten fantastic and majestic waterfalls in under a 9-mile loop. The most popular waterfall is South Falls. 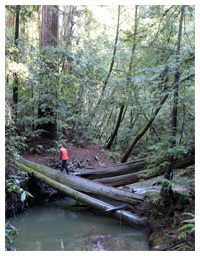 It begins as a gentle stream then suddenly plummets 177 feet into a misty pool. The scene is dramatic. 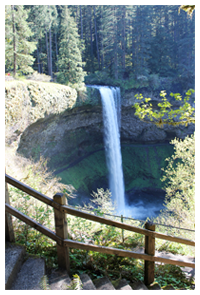 Visitors can easily walk a loop trail behind the falls or enjoy views from a footbridge. 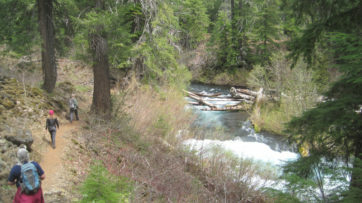 Located about a mile downstream is the Lower South Falls. 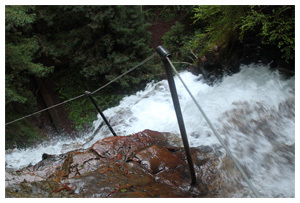 Here the trail descends abruptly – by more than 180 steps – then sneaks behind the roaring 93-foot torrent allowing the visitor to see the world from behind a shimmering curtain of water. The trail turns up Silver Creek revealing dozens of tiny waterfalls gushing from the side of the hill. In some areas, a hand gently placed on a moss-lined wall of green carpet disgorges water like a sponge when squeezed. The 30-foot Lower North Falls gush into an azure basin. A nearby trail spur guides visitors to see Double Falls, a double drop, with a combined height of 178 feet, the tallest in the park. A short distance upstream is Drake Falls. This is the smallest in the park, but at 27 feet they this grand cascade is a beauty. The falls were named after June Drake, whose early photographic work brought attention to the area and ultimately helped with the areas protection. The North Middle Falls roar as water drops 106 feet over the top then crashes onto rocks underneath. Visitors can take a short side trail that allows them to walk behind this liquid veil – the water rumbles past just a few feet away. 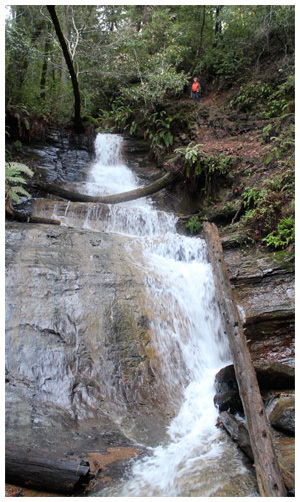 Next, we take a side trail to the graceful looking Winter Falls. Standing at the base a visitor looks up 134 feet to the top. As the name implies Winter Falls is best viewed during the winter and spring seasons. 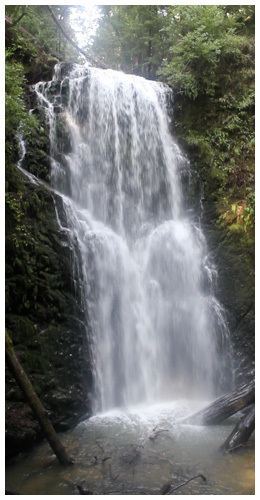 Twin Falls, at 31 feet, received its name from rocks in the streambed that splits the water forming two cascades. The North Falls is powerful and thunderous. 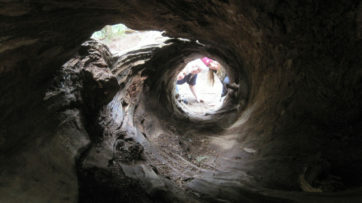 The water channels through a notch in the creek bed then is jetted into a canyon 136 feet below. Behind the waterfall is an impressive cavernous cutout that is almost like entering a different realm; water drips over the upper canyon wall forming a curtain of water across the path. Inside the cavernous area, ferns grow upside down on the ceiling. But, what really grabs you is the thunderous sound of water, which is a loud as a freight train when it passes frightfully close. A short distance upstream is the Upper North Falls, a beautiful 65-foot cascade that plunges into a picturesque and deep pool. Often overlooked by visitors these falls are not to be missed. 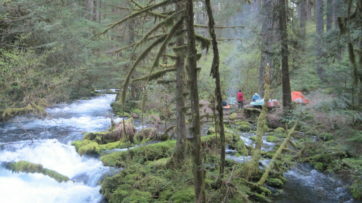 The trail returns through the forest to the parking area near South Falls. Winter is a great time to visit; the park is less crowded, the falls are at maximum flow, and everything in the forest is green. 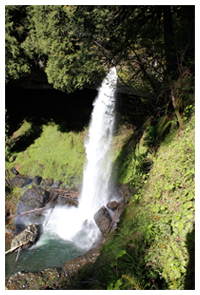 Silver Falls State Park is located less than an hours drive east of Salem, Oregon. 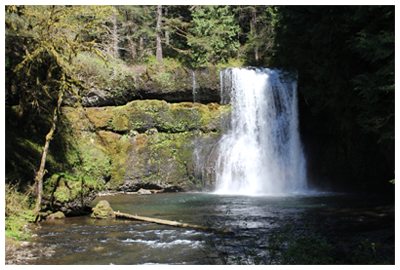 If you have the opportunity to explore Silver Falls State Park in Oregon it is well worth the visit. During a trip to the Beaver State, a short drive off Interstate 5 led me through farm fields and green pastures to the lower elevations of the Cascade Mountains. As the elevation increased Douglas Fir and cedar trees carpeted the countryside until I was in a forest of green. Inside the park, I stopped at the small parking area called the North Falls trailhead. From here it was a ten-minute walk along an easy path to the Upper North Falls. Ferns and moss carpeted the sides of trails and the cool moist air was invigorating. The falls were impressive – falling 65 feet (20m) into a deep emerald colored pool. The roar from the water would have made speaking a little difficult to hear, but there was no need to talk. In the opposite direction, past the parking area, was a short walk to the North Falls. Bordering the trail the North Fork of Silver Creek cascaded over boulders and rocks, then the water vanished from sight – and was replaced with an audible roar. A few more steps brought me to a good vantage point – the view was literally jaw-dropping. The stream was in free fall over a 136 feet (41 m) cliff. The water appeared to hang in mid-air for a moment then in slow motion fell onto car-sized boulders and into a deep blue-green colored pool at the base. Behind the waterfall was a dark overhang, cave-like, colored with green moss and plants. The shape of the valley was reminiscent of the old wrap around Cinemascope movie theaters. Across the valley, some hikers had walked along the Canyon Trail near the base of the falls. They appeared to be mesmerized by the sight of the falling water and stood transfixed for several minutes in awe of the performance. After some time we continued on our way to the next area. Driving down the road we made a stop at the North Falls Viewpoint. It was a fantastic perspective of the falls we had just visited. We were roughly a quarter of a mile distant; the falls appeared to our front and center in a perfect photograph framed with green forest. At the main area of the park, we walked along a cobbled path and along the South Fork of Silver Creek. Here the stream is graceful and gently flows through a green and tranquil area; then there is an absence of the ground; the water of the entire stream dramatically plunges 177 feet (54 m) over South Falls into a pool below. The mouth of the pool is at the base of a giant horseshoe-shaped depression for the water to pour into. Gray rocks line the overhanging cliff and green moisture-loving plants accentuated the entire scene – it was a gift to see. Below the falls was a trail known as the ‘Trail of Ten Falls.’ This 8.7-mile footpath takes day trip explorers to see ten beautiful falls; including the ones we just saw. I will be returning to visit this trail and see more of the park. My short trip that day was only an enticement to see more! The day use fee at the park was $5 – and well worth it. We had to use an ‘Iron Ranger’ to pay our fee, so bring some smaller bills to place in the envelope as making a change might be difficult. Our visit was before the busy season and the water fountains were turned off making filling up our water containers difficult. The folks in the Nature Store offered us some water from their sink – which we gladly accepted – and we offered a few dollars to their donation jar in good faith. If you come before or after the summer months bring some extra water or filtering device so you will not be thirsty. Based on the size of several parking lots and distance (about 30 miles from Salem) this park receives some high visitation during weekend and summer months. If you want fewer crowds visit during mid-week or during off times. Everything in Sequoia National Park is on an immense scale and Tokopah Falls is no different. Tokopah Falls is the tallest waterfall in Sequoia National Park. Visitors can see it descend along a series of whitewater cascades, falling 1,200 feet (365 meters) in just about one mile of distance (1.6 km)! Imagine standing in a glacial-formed valley surrounded by tall walls of granite. Before you is the beginning of the valley – a steep headwall that rises a quarter-mile to the skyline. At the skyline, a white ribbon of water plummets from a large notch in the mountain. The water rushes down the steep cliff wall, darting and jumping, twisting and turning around jumbles of boulders. Such rocks might look petite from a distance, but they are the size of houses and cars. Quickly the ribbon appears larger and has a defined movement, the cascades grow larger and closer. At the base of the waterfall, a torrent of water tumbles over a cliff – it crashes into a deep pool of rolling and exploding white. This is Tokopah Falls. Late spring offers the most dramatic views as snowmelt swells the river; though in the summer, as the snow disappears from the mountains, it is possible for the falls to appear almost dry. Regardless of the water level, this is a beautiful area. Getting to Tokopah Falls is an enjoyable walk through forests and meadows next to the picturesque Marble Fork of the Kaweah River. 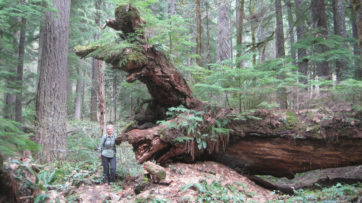 The trail is 1.7 miles (2.7 km) one-way with just 500 feet (152 meters) of elevation gain – making it a good trip for families. 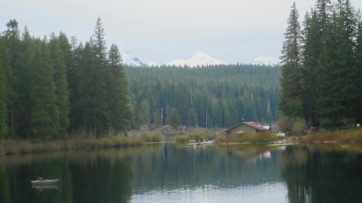 The trailhead is located within the Lodgepole Campground on the north side of the easy-to-see stone bridge. The bridge area has easy access to the river and on hot days visitors take full advantage of the cool water. The park’s shuttle bus makes a stop at the campground just a few steps from the trailhead. As you walk up the trail look for an impressive stone feature called the Watchtower on the south side of the valley. It dominates the skyline, rising 1,200 feet over the valley, so it is not hard to miss. The Watchtower is so big that it is a constant companion on the way to the waterfall. On this trail, my family has seen a variety of animals including mule deer and a black bear with two cubs. During summer the trail is used by a lot of visitors; if you want to avoid crowds travel in the early morning or late afternoon. 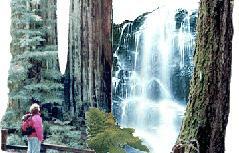 A visit to Mist Falls in Kings Canyon National Park is one of the great sights of the park. The hike is moderately strenuous with about 800 feet of elevation gain. The round-trip is roughly 9.2 miles and can take up to 5 hours to complete, though we took 6 hours with all of our sightseeing. Our day began at 8 in the morning. We started at the aptly named, ‘Roads End.’ This circular loop on Highway 180 is literally the ‘end of the road’ as this main Highway in the Kings Canyon stops and doubles back. From this point, the rugged wilderness is enjoyed on foot. Immense glaciers once ruled this place, everything has been scoured and etched in some way by their great presence. Perhaps the most dramatic result is the great canyon walls that rise from the valley floor several thousand feet. The sand and gravel trail continued for roughly 2 miles through forests, past great boulders and along the beautiful South Fork of the Kings River. Near the Bubbs Creek Trail junction, we saw a Black Bear. It was a magnificent sight! We quietly continued on our journey and allowed the bear to enjoy his day. 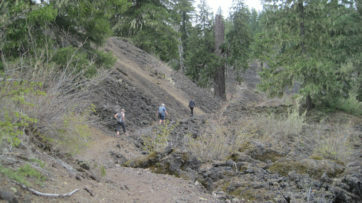 At the Bubbs Creek junction, the trail begins an incline. Here the river can conceal emerald pools hidden like gems along the trail. Quickly these pools turn to gentle rapids then become a series of white-water cascades that continue all the way to the falls two miles up the trail. Finally, we reached Mist Falls. We could hear a roar as white-water exploded over the falls and tumbled beneath. The wind moving over the falls carried a fine mist downstream and into the surrounding forests. It was actually chilly. After drinking in this view we continued up the trail to another vantage point. Here the river’s channel created a flume. The flume slammed into a submerged boulder and catapulted a frothy and boiling mass of water 20 feet into the air – then disappeared over the edge of the falls. Further up the trail, we found a great view overlooking the falls. It was a sight. We enjoyed some lunch and this delicious experience. Every member of the family can enjoy a quick visit to the Roaring River Falls in Kings Canyon National Park. 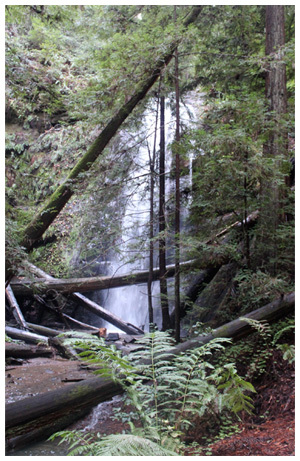 The falls are beautiful, picturesque and a short distance (.4 miles/.6 Kilometers) from the parking area adjacent to Highway 180, the major road in the canyon. The paved trail leads to an overlook making this a convenient destination for all ages. Visitors can see about 80 feet of the falls as water tumbles through a gorge and unleashes a loud roar of water and spray into a turquoise pool below. Surprisingly, this visible section is only the lower third of the falls. The rest of the falls remains hidden – except to the imagination. The trail ends at the overlook because of the steep and rugged topography. The easy accessibility of visiting Roaring River Falls can make the trail crowded and parking hard to find on weekends and during afternoons. If possible, visit the falls in the morning or evening when your family might just be the only people witnessing the sights and sounds of this inspiring place.